Our younger daughter, Sasha, is autistic. She was diagnosed with ASD (Autism Spectrum Disorder) at the age of two and a half, over eight years ago. This blog began the day autism was suggested to us by a paediatrician. Around a year later we stumbled across the description of Pathological Demand Avoidance on the internet and went on to read the book Understanding Pathological Demand Avoidance syndrome in children. We finally felt like we could begin to understand and help our little girl. Now I want to share those insights with others. PDA is a type of autism spectrum disorder (also called autism spectrum condition; both are now often shortened to be called simply autism). The other two known profiles are Asperger Syndrome and classic autism (Kanner's). In the 1980s, Elizabeth Newson, an international expert in autism, first recognised a group of children who were similar to other autistic children but with some common differences. In 2003, an article titled 'Pathological demand avoidance syndrome: a necessary distinction within the pervasive developmental disorders' was published in the British Medical Journal. Pervasive Developmental Disorder (PDD) was the over-riding term previously used in medical manuals for all autism spectrum disorders. Atypical autism or PDD-NOS (with the NOS standing for Not Otherwise Specified) are diagnoses used previously in the UK and still commonly used in the USA. I suspect that when PDA becomes more widely understood over there, many more parents will find this category a better 'fit' for their children. Every autistic individual is unique and has different characteristics. So it stands to reason that there will be cross overs and situations where a clear cut diagnosis is not possible or even beneficial. There are several other co-morbid conditions which are often found in those diagnosed with autism; those in the outer green circle in image below. 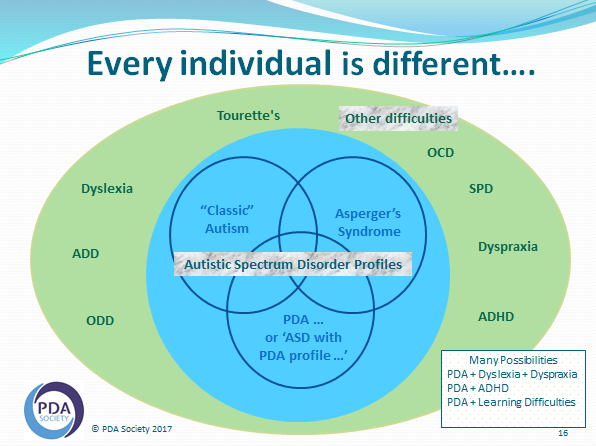 Tourette's, OCD (obsessive compulsive disorder), SPD (sensory processing disorder), ADHD (attention deficit hyperactive disorder), Dyslexia and Dyspraxia can be identified in some, but not all, children with PDA. Those conditions are not autism spectrum disorder profiles; they can be present in individuals who do not have a diagnosis of autism. PDA is however, a type of autism. PDA is 'an anxiety driven need to be in control and avoid other people's demands and expectations'. The control helps them manage their anxiety so that they know what to expect and don't have to comply with demands which they find too difficult. 'Can't help won't' is a phrase often associated with Pathological Demand Avoidance. In a nutshell, this explains that individuals with PDA can't help the fact that they won't do something - the reason they won't is because they can't; it's too difficult for them. Dr Ross Greene's philosophy is well worth further reading: 'kids do well if they can'. If they can't, it's because they are lacking in skills. Some of those skills are teachable over time, but the fact that some are missing is an inherent characteristic of the autism diagnosis. Most people don't stop to assess how many demands we place on others, particularly children, during an average day. 'Wake up, get up, get dressed, brush your teeth, eat breakfast, comb your hair, put your shoes on, get in the car...' and many more, all before 830am for those going on the school run. They continue during the school day; 'sit down, cross your legs, get your books out, raise your hand if you want to talk, be quiet, line up for assembly...' and so on. Those are the direct demands, which are obvious to see once thought about. Then there's the added stress of indirect demands. Peer pressure, wanting to fit in a group and being social but not knowing the rules, time pressures with bells ringing and transitions to new subjects or new classrooms needing to happen, sensory issues causing discomfort whether that be noise or smells or the feel of unusual fabric or hard chairs to sit on. The fear of the unknown, the dread of attention being focused on you, the knowledge that if you do well and are praised, then further, more difficult work is likely to follow. All of the above can raise the anxiety levels of an individual with PDA to a point where an overload, or meltdown, ensues. Challenging behaviour is a phrase used to describe actions which are difficult for the person they are directed at. This could include destructive behaviours, hurting others, kicking, hitting, running away and self-harm. Our girl mostly refuses rather than any of those actions; she curls up into a mushroom shape and is impossible to move. As she gets older, her withdrawal is accompanied more often by screams and anger. Still all challenging, but not to the extent that some families have when violence becomes a regular feature. It's important to keep everyone safe in the moment, but later look behind the behaviours to understand the cause. Then assess what can be done to alter environments or conditions so the anxiety doesn't overspill. For more support with challenging behaviour, please visit The Challenging Behaviour Foundation and Yvonne Newbold's website. Pathological Demand Avoidance is a profile of autism. Oppositional Defiant Disorder (ODD), Attachment Disorder (AD) and Conduct Disorder (CD) are not types of autism. Sometimes ODD is given as a diagnosis when the underlying autism hasn't been identified. Strategies suggested for ODD, AD and CD (such as stricter boundaries and consequences) can actually increase anxiety levels and have not been found to be effective in the long term (or even short and middle term!). For more reading on all these conditions, please visit my blog post 'The difference between PDA and ODD'. 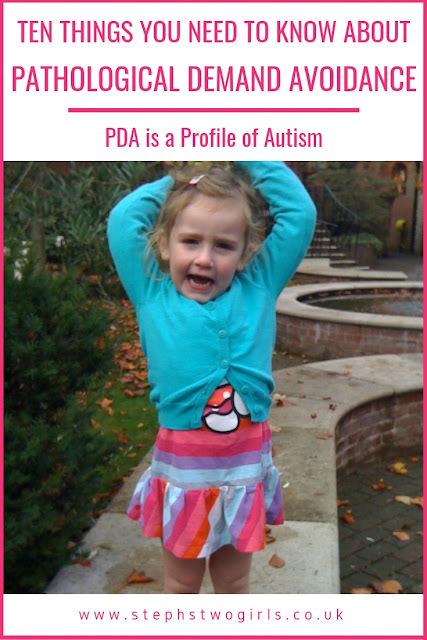 The reason why it is so important to understand and diagnose PDA correctly is that the best way to approach and support individuals with PDA is with very specific PDA strategies. Society conditions us to believe that there is only one way of parenting. The typical pattern is set with the adult being in charge, imposing conditions and rules on the child. In reality, our job should be to share our wisdom and experiences in order to help guide children through life. That doesn't mean that there are no boundaries for children with PDA; it just means that we have to work much harder to understand needs and enable our children to achieve their best in a society which is overwhelmingly neurotypical (or is it?!). Believe me, if I could use typical parenting strategies for my younger daughter, I would. They have been pretty successful for our eldest girl and involve a lot less effort. Star charts, naughty step, rewards and consequences... we tried them first, of course, and it's a fairly solid way of discovering whether you are living with a child with PDA. Demand Avoidance is something which everyone can show, at the point when they don't want to do something. Toddlers who don't want to be told 'no' to more chocolate, teenagers who choose not to tidy their rooms, adults who put off doing important work or making appointments (ahem), children who don't want to do PE. They can show avoidance in a variety of ways; outright refusal, procrastinating, distracting, making excuses. This is not the same as Pathological Demand Avoidance, which is an autism spectrum condition characterised by extreme anxiety. This means that even simple, everyday activities, which a child may enjoy doing (such as going to the park, for example) become impossible to achieve because either the demand is phrased wrong, or comes at the wrong time, or is one of too many that day. I've tried to explain the difference further in my blog post Autism with demand avoidance or Pathological Demand Avoidance? To give an indication of whether a child has Pathological Demand Avoidance, please look at the characteristics list on the PDA Society website. There's also the EDA-Q (extreme demand avoidance questionnaire) which is not a diagnostic tool but which can be used as a guide. There are many strategies which can be suggested to help with PDA, and I've covered some of these in a previous blog post on strategies (there's one on PDA strategies for schools too). They include (but are not limited to) planning ahead, being flexible, always having an exit plan, offering choice and building a trusting relationship. One of the most important strategies is choosing the right way to communicate. Rephrasing so demands are not direct is vital - so instead of 'you need to...' or 'it's time for you to...', switch to 'perhaps we can...' or 'I wonder if it's possible...'. Humour works well; turning things into a game distracts and can make the task seem less urgent and necessary - 'I bet you can't do that before I've done ten star jumps' for example. We have often joked that our daughter's favourite word is 'no' - but only if she is saying it. We rarely use it ourselves, as it would be the cause of much distress. That doesn't mean that there are no boundaries; what it means is that we say no in a different way to soften the blow. For example 'well, that sounds like a great idea, but we might have to wait until we've saved up enough money for that' or 'I'm sorry it's not possible now but we'll make sure we can do it next week when the weather is better'. I can hear some scoffing at this, not understanding why it should be necessary. Shouldn't adults be setting the rules and just saying it how it is?! Believe me, if it was that easy, we'd be doing it - in fact we do, with our older daughter. 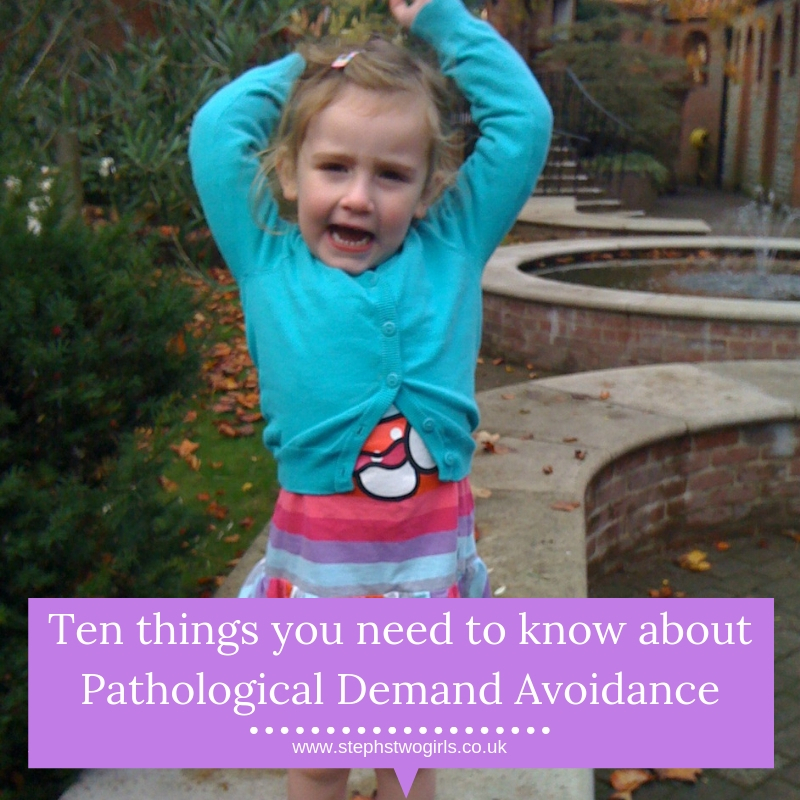 With Pathological Demand Avoidance, it's just not that simple. Using the right language can be key to keeping those anxiety levels from flowing over though. Just like the overriding autism diagnosis, Pathological Demand Avoidance is a lifelong condition. It won't simply go away or be grown out of, but can be helped by others around using the correct strategies. It has been a huge comfort to us to hear from adults with PDA and to know that the future can be rosy. I suggest reading the blogs of Julia Daunt (Me, Myself and PDA) and Riko (Riko's blog: PDA and more) as they offer a real insight into what it is like to live with PDA. I also urge you to watch this video where Isaac Russell talks about experiences with Pathological Demand Avoidance. It's eye-opening. OK, I know I said ten... but I needed to add one more. Our daughter has PDA and she is witty, affectionate, charming, sociable, chatty and creative, with a great imagination. She, and many others with PDA, deserve to be better understood. I believe that society can change, but only if we are educated to understand. Please share if you want to help!